The stone foundation of a nineteenth century Catskill Mountain house marks this hill top – locally known as Star Rock. The new house, engaging this stone ruin as a forecourt, has its own stone base, clapboard sheathing, antique doors and windows. 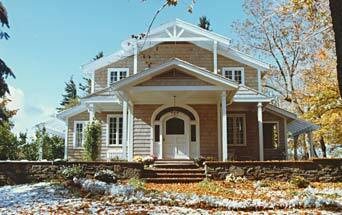 This energy efficient design includes a passive-solar sun room, a Rumford fireplace and a dual-fuel furnace. The local utility was required, for the first time, to buy back excess electricity produced by an onsite wind generator.